Must be ordered in 100 increments. PLEASE NOTE: Dates and times on all schedules are subject to change without notice. Schedules shown online may not represent actual current schedules and are intended to show color, theme, fonts, general layout, etc. of stock schedule. Schedules will be updated as current season approaches. Schedule date and times are taken from official websites of each sport and are subject to change and availability of the individual professional sport scheduling system. 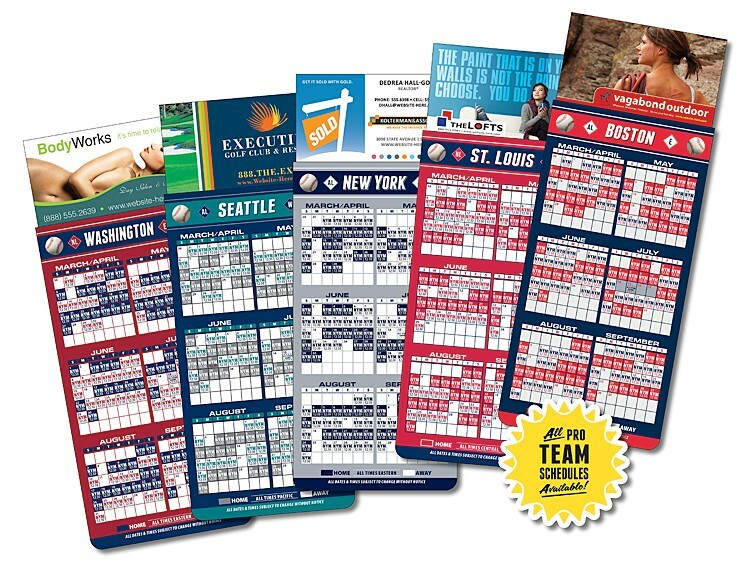 Our stock schedules ARE NOT endorsed by any professional sporting organization/team. Various schedules may include TBD's for game and/or times when order is received 3 weeks prior to opening game week. Custom schedules are billable at $60(C) per hour.